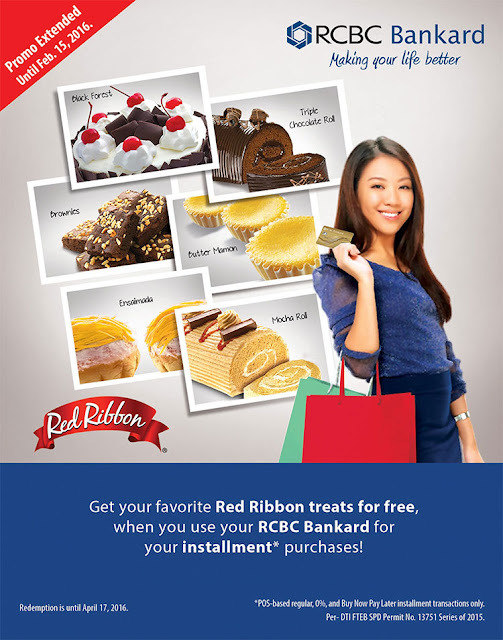 Get your favorite Red Ribbon treats for free, when you use your RCBC Bankard for your installment* purchases! Red Ribbon items for free: Black Forest, Triple Chocolate Roll, Brownies, Butter Mamon, Ensaimada and Mocha Roll. 1. The promo is open to all existing principal and supplementary cardholders of RCBC Bankard whose accounts are active and in good credit standing. 3. To qualify for FREE Red Ribbon Treats, the cardholder must make a POS-based installment purchase (regular, 0% or BNPL) of Php25,000 (single-receipt or accumulated receipts worth at least Php10,000) at any merchant during the promo period, using an RCBC Bankard Credit Card. Note: RCBC Bankard Corporate Cards are excluded in this promo. Purchase Requirement: Minimum of Php 25,000.00 single-receipt, POS-based 0% installment purchase or accumulated 0% Installment receipt POS-based purchase, minimum of Php 10,000.00 per charge slip. A. Only electronically-authorized 0% installment transactions in Philippine Peso through Point of Sale terminals from merchants shall be acceptable for redemption. Manual charge slip/s, which are processed through voice authorization, are strictly not acceptable for redemption. B. UNLI 0% Purchase Conversion transactions are excluded from this promo. C. Foreign currency transactions and all other transactions that are not supported by valid charge slip/s such as, but not limited to online purchases, mail/telephone-order transactions, convert-to-Installment transactions, cash advance, Fast BillsPay, Cash Loan and Your Cash availment are not eligible for the promo. D. RCBC Bankard and Red Ribbon will not honor redemptions using official receipts or the credit card statement of account. 5. To redeem, the cardholder must present his/her RCBC Bankard and surrender the ORIGINAL credit card charge slip (Customer’s copy) for proper validation at participating Red Ribbon outlets nationwide. Cardholder information and transaction details on the charge slip must match those on the RCBC Bankard credit card presented and must comply with the promo mechanics. 6. Cardholders can redeem up to a maximum of three (3) FREE Red Ribbon Bundle Treats per card, per day, per outlet. 7. Unreadable and/or duplicate charge slips will not be acceptable for redemption. 8. Redemption is valid for dine-in and take-out only and is not valid for delivery. 9. RCBC Bankard shall not replace lost or stolen charge slip/s. 10. RCBC Bankard reserves the right to charge the cost of the FREE Red Ribbon Treats redeemed against the cardholder’s RCBC Bankard Credit Card should his/her redemption be found to be fraudulent. 11. Splitting of a single-receipt card transaction to generate multiple transaction charge slips is not allowed and shall be deemed fraudulent. 12. The offer cannot be exchanged for cash, rewards points or products other than the offers indicated above. 13. Qualified cardholders may avail of the Easy Terms 0% interest for a minimum single purchase worth P3,000. 14. Easy Terms 0% interest is applicable if the cardholder pays his/her monthly installment in full. 15. Participating merchants have sole discretion on the term/s and item/s applicable for the Easy Terms 0% interest offering. 16. RCBC Bankard credit cardholders have the option to charge their 0% installment transaction on Buy Now Pay Later scheme wherein the first monthly amortization will be posted to cardholder’s third cut-off date. 17. RCBC Bankard Easy Terms 0% Installment is subject to RCBC Bankard’s approval. 18. The approved installation transaction is automatically deducted from the cardholder’s available regular credit limit. 19. If cardholder decides to pay the installment plan in full before maturity, a pre-termination fee of Php 500.00 or 5% of the unpaid principal amount, whichever is higher, will be charged. 20. In case of dispute with respect to the cardholder’s eligibility, coverage of the promo dates, fulfillment, etc., RCBC Bankard’s decision shall be conclusive. All questions or disputes regarding the cardholder’s eligibility for the promo or for any redemption shall be resolved by RCBC Bankard with prior approval from DTI. Per DTI-FTEB SPD Permit No. 13751 Series of 2015.